Our Parish recently hosted the National Launch of Catholic Schools Week. The adjacent art work was designed by Dymphna Clenaghan for this special launch. It depicts the story of the Sower sowing the seed. 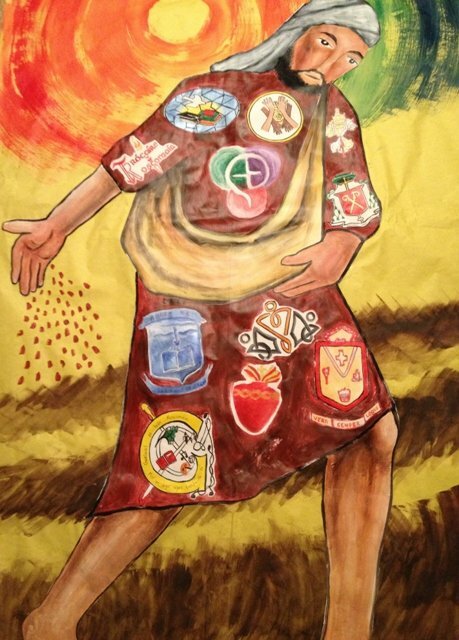 On the sower’s tunic, we can see the logos of the schools in the parish, as well as the Papal Coat of Arms, Diocesan Coat of Arms and the Logos for the Parish, Catholic Bishops and Catholic Schools Week. Together we spread the seed, sharing God’s Word as communities of faith. Contact Details for the Schools in the Parish can be found below. A highly skilled, experienced staff, with a wide range of talents, provide a broad curriculum and wide range of activities. In preparing children for the future, we aspire to achieving excellence in all subjects. Each and every child is given the opportunity to taste success regularly. The Abbey N.S is a large boys’ school nestled amid a myriad of historical sites in Roscommon town. A strong pride of place is instilled in our pupils as an integral part of our delivery of the primary curriculum. Sport – Gaelic, Soccer, Hurling, Spikeball and Athletics – the Arts, Green Schools initiatives, Science, Walking Tours of historical sites, Arts Festivals and educational tours, far and near, serve to enrich our pupils’ educational experience. Mission Statement: Staff at the Abbey N.S. strive to provide a well-ordered, caring, happy and secure atmosphere, where each child is encouraged to reach his full potential – intellectually, spiritually, physically, morally and culturally, while recognising the individuality of each child. Is gnáth-bhunscoil í Gaelscoil de hÍde, Roscomáin, a bhunaíodh sa bhliain 2000 agus a fheidhmíonn faoi ghnáthrialacha na Roinne Oideachais. Is í an Ghaeilge an teanga teagaisc sa scoil agus an teanga cumarsáide idir na múinteoirí, na páistí agus an Bord Bainistíochta. Gaelscoil de hÍde, Roscomáin, was founded in 2000 and it operates under the rules and regulations of the Department of Education and Science. Irish is the medium of teaching in the school and it is also the means of communication between the teachers, children and Board of Management. Since our foundation in 1937, the Christian Brothers’ Secondary School Roscommon has been a forward thinking community, one which provides the very best environment and atmosphere to foster excellence inside and outside the classroom. As a Catholic Boys’ Voluntary Secondary School under the Edmund Rice Schools Trust (ERST), our ethos is to promote the happiness, dignity and self-worth of each student, and inspiring them to become transformational leaders within the community. Mission Statement: CBS Roscommon identifies and serves the needs of students and puts in place appropriate resources, curricula, programmes and methodologies to enable everyone to achieve his potential. We believe in having high expectations for all of our students. Students consistently perform better when they know that their teachers and parents believe in them. Meánscoil Muire gan Smál (Convent of Mercy) is an all girls Catholic Voluntary Secondary School on Convent Road in Roscommon Town. Founded in 1929 by the Sisters of Mercy, the school is now under the trusteeship of CEIST. Mission Statement: In our school we wish to provide a caring environment for all students and staff, in which every student is helped towards her fullest spiritual, educational, social, cultural and physical development. Roscommon Community College is a co-educational school that has provided excellent educational provision for the town of Roscommon for over 70 years. The College is committed to a high quality education service and takes as its ethical base the needs of the students in its care. Roscommon Community College offers an extensive programme of Junior and Leaving Certificate subjects as well as providing alternative programmes of study for students with specific learning requirements. We pride ourselves on a low teacher pupil ratio which allows for smaller, more focused classes. Students are banned according to ability and are encouraged to take as many higher level subjects as appropriate.